Home » Did You Know » What do a pumpkin patch, a spy, and a future president have in common? 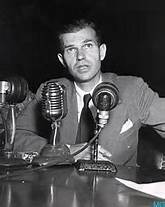 “Alger Hiss was a highly regarded adviser to President Franklin Delano Roosevelt. 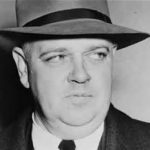 On Aug. 3, 1948, Whittaker Chambers, a senior editor at Time magazine, told the House Un-American Activities Committee that Hiss had given him State Department secrets as a Communist underground member in Washington a decade earlier. Chambers claimed that he, in turn, passed the documents to the Soviet Union. Hiss denied everything, saying Chambers was just a casual acquaintance. Chambers took investigators to his Maryland farm and produced a hollow pumpkin. Inside, they found microfilmed State Department documents – documents Chambers said he received from Hiss. 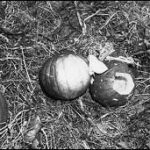 The hollowed-out pumpkin at Chambers’s farm that contained two rolls of undeveloped film. Chambers led House Un-American Activities Committee (HUAC) investigators to the pumpkin on December 2, 1948. He also handed over typewritten copies of government documents. In the course of the trial, prosecutors produced an old typewriter once owned by Hiss and his wife; they said the typewriter was used to copy the documents, and alleged Priscilla Hiss had done the typing. Hiss was convicted of two counts of perjury, disbarred and thrown in jail for three years and eight months. 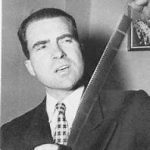 Richard Nixon, a freshman congressman at the time, rose to fame on the coattails of the scandal. Copyright 1998 CBS. All rights reserved. This entry was posted in Did You Know? on October 13, 2016 .